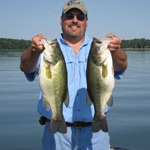 Doug grew up fishing Minnetonka and has been guiding professionally since 1995. He enjoys pursuing fish of all species and is a multi-species angler/guide. His life passion is fishing and he enjoys teaching others how to catch fish. Doug has conducted several fishing seminars, kids’ fishing outings, radio shows, tv shows and also writes fishing articles for publications and UpNorthOutdoors.com. He has been competing in competitive fishing tournaments since the early 90’s and has logged many top 10 finishes in both bass and walleye tournaments across the upper midwest. Doug has competed in the Masters Walleye Circuit (MWC) tournament trail and other walleye tournaments in the upper midwest along with local bass tournaments on Lake Minnetonka. Fish in style and comfort from his fully loaded 2013 Ranger 620 DVS complete with 250 HO Evindrude E-Tec, Evinrude E-Tec Kicker motor, Humminbird Premium Electronics, MinnKota bowmount trolling motor and Sirrius Radio. Joe grew up fishing on a variety of lakes in Western Minnesota. He has been very active in Walleye Tournament fishing in excess of 20 years and has gained a great deal of fishing techniques and experience as a result. Joe is very passionate about fishing and is a skilled fisherman with respect to all species of fish. He has actively fished and guided on Lake Minnetonka for many years and enjoys sharing his knowledge and experience of fishing with his guests. Joe fishes from the newest, fully loaded, and comfortable Ranger 620 deep water boat. The boat is powered by an Evinrude E-tec motor and is equipped with the latest Minn Kota and Humminbird Electronics. Please contact us for a fishing experience on Lake Minnetonka or a variety of other Minnesota Lakes. Larry Hanson has been fishing the waters of Lake Minnetonka since he was a small boy fishing from his grandparent’s dock. A lot has changed since then except for Larry’s passion for fishing and his love for Lake Minnetonka. Larry has been fishing walleye, largemouth, and smallmouth bass tournaments successfully for 20 + years. Larry is a multi-species expert. Larry fishes out of Yar-Craft boats with Mercury motors. Lake Minnetonka Guides also networks with many of the other accomplished professional anglers and guides in the area. We can accommodate larger groups and corporate fishing outings on Lake Minnetonka just west of Minneapolis. Please contact us for more information.